It is too late again to analyze the largest accidental oil spill in the history of petroleum industry. the only question is, what is deepwater horizon ? I just found that deepwater horizon actually the name of an mobile oil rig. previously, I imagined that deepwater horizon is a specific glossary on petroleum industry. I googled it and finally found that it is not a specific glossary, just a specific name of mobile oil rig that exploded on the Mexico gulf in the middle of 2010. The Deepwater Horizon was a 9-year-old semi-submersible mobile offshore drilling unit, a massive floating, dynamically positioned drilling rig that could operate in waters up to 8,000 feet (2,400 m) deep and drill down to 30,000 feet (9,100 m). the most interesting are the complex network behind the rig. we can see the interaction among world biggest petroleum company. the rig was produced by Korean heavy industry manufacturer, Hyundai and owned by Transocean. subsequently, the rig was operated under Marshallese flag of convenience. between March 2008 to September 2013, BP leased it. 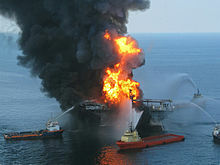 unexpectedly, the rig exploded in April 2010.